Sprint Tuesday announced a new bundled app service for its family-plan customers using Android phones. Using both Lookout Mobile Security and Safely apps, the service is designed to help you easily set up location-tracking apps as well as security apps for multiple Android phones on a single family plan. 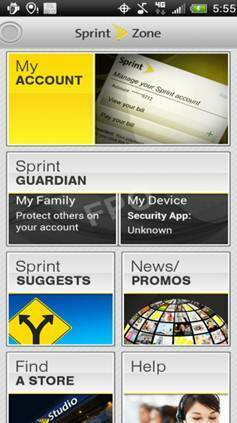 Sprint customers will have a choice of various app choices: The $9.99 per month Family Safety apps, the $4.99 per month Lookout Family Device Security app, or $14.98 per month for a bundle of the two. When customers decide to sign up for the service via the Sprint Zone, they’ll see a dashboard listing all of the numbers on their plan. The Lookout app basically functions the same as the standard premium Lookout app, but you can apply the service to multiple lines. You get access to malware protection, phishing safety, and missing-phone locator features. You can manage your family’s devices at mylookout.com as well as back up photos, contacts, and call history. The Safely Family Safety app bundle includes a variety of apps meant to keep your children safe from their cell phones (in so many words). Sprint Mobile Controls let you track your kids’ app and texting habits. You can lock your kid’s phone on a schedule (like no texting after 10PM!) or on demand. Sprint Drive First is meant to put an end to teens' use of texting while driving. It automatically locks your teenager’s mobile phone when they’re traveling over 10mph, and then unlocks when they stop driving. If they’re simply texting in the back seat of the car, they can override the lock, but a notification will go to the parent. Sprint Family Locator is an app that uses geofencing to let you quickly locate your family on a map. You can set boundaries so you are notified about when your kid comes home or if they’re leaving a designated zone (like your house). One weakness with the service is that it is limited to only Android phones for the time being. If your kid has a feature phone or a Windows phone, they will not be able to use the service. We got a quick hands-on with the service and the interface is clean and easy to use. I’m a little concerned that you can only find it within the Sprint Zone, but Sprint ensured me that customers will be educated about Sprint Guardian when they buy a new phone on a family plan. On the plus side, Sprint isn’t pre-loading these services on upcoming smartphones, keeping with its promise to cut down on carrier-added software.